The very versatile FM680 is a high performance Xilinx Virtex-6™ based XMC & PMC industry standard VITA 42.3 compliant module. The FM680 has been designed to be a multi-function high-performance digital signal processor. 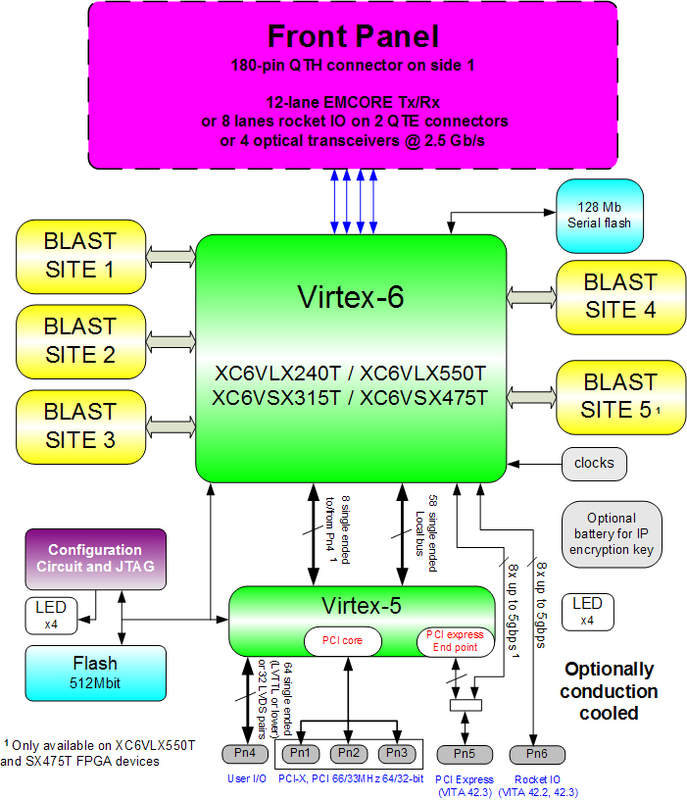 The Virtex-6™ FPGA device available on board is user programmable and can be used for the implementation of high end signal processing algorithms. Based on customer requirements, front panel I/O modules may be added to enable the FM680 to perform data acquisition and waveform generation, high-speed communication, image processing and many complex DSP applications. Additionally, customer may configure the FM680 select from a variety of memory options such as QDRII SRAM, DDR2 SDRAM and DDR3 SDRAM. Optionally, the user configurable BLAST™ mounting sites may also be populated with JPEG2000 CODECs, solid-state flash drives or even a customer’s specific logic devices or circuit designs. XMC to PCIe adapter available.